This year’s recipients share a dedication to community service that began in early childhood. Read on to find out how these Hunger Fighters have taken their commitment to feeding the hungry to another level. When most people reach their golden years, they look forward to slowing down and taking it easy. One might assume, then, that this particular Hunger Fighter Award is honoring a senior citizen who goes above and beyond the ordinary, and that part is true. But Eola Cross is anything but ordinary! She has not only dedicated her entire life to helping others, but for more than 20 years she has been the site coordinator for the Grey Bears’ “Healthy Food for Seniors”, a local program dedicated to the health and well-being of senior citizens in Santa Cruz County. Eola’s weekly schedule includes – but is not limited to – overseeing a crew of truck drivers, coordinating the distribution of hundreds of bags of food, cooking and delivering food for the Seventh Day Adventist meal for needy families and the homeless, and picking up produce from Second Harvest Food Bank in the early morning hours so she can personally deliver it to seniors who are home-bound. Any and all of these voluntary duties are commendable, but there’s one more thing that’s noteworthy about Eola: she’s 91 years old. Eola believes that her commitment to helping others stems from her experiences as a girl during the Great Depression. Her memories are vivid as she recalls the challenges her family faced in De Queen, Arkansas. Her father was working for the town, and her mother was raising Eola and her 8 brothers and sisters. And then the Depression hit. Soon everything in town closed down, including the local bank where her parents kept their small savings. Without their money, they could no longer keep their house, and the large family – which now included a boy whom her parents had taken in because his parents had died — ended up living in a tent next to a creek. Eola’s grandmother, whom she admired for her kindness and generosity, sent her parents $10 and suggested that they come to Texas where they might be able to find work cutting cotton. Young Eola promised God that if He allowed her to live and not to starve, she would make it her mission that no one she’d meet would ever go hungry. “And that’s what I’ve done my entire life,” she says. When she grew up, Eola became a nurse, married her husband, Lester, had a family, and moved to California. Just as her parents had done, Eola and Lester opened their home to children who needed a loving, stable environment. “The kids came to us in all different ways. Sometimes they found us and sometimes we found them. Lester and I liked having a house full of kids.” The couple ended up fostering more than 100 children over the years. It is with great sadness that this story must begin with the news that Margaret Sandoval, the beloved matriarch of the Sandoval family, has passed away. 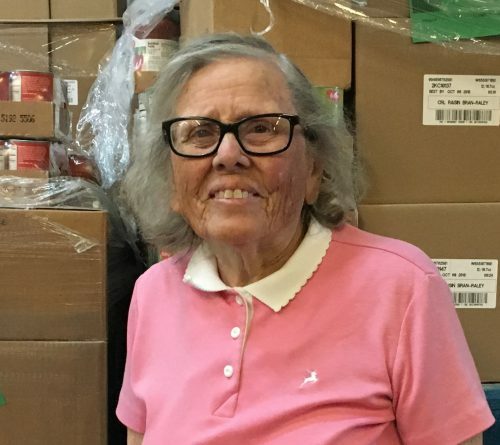 Margaret will be greatly missed by her family, friends, and all who knew her through her decades of volunteering at Second Harvest Food Bank, but her kind heart, independent spirit, and selfless dedication will never be forgotten. Margaret and Don Jesus Sandoval, along with their sons Sal and Ignacio (Nacho), are receiving Second Harvest’s Hunger Fighter of the Year Award for their extraordinary dedication to the Second Harvest community. While the family has tallied an incredible 10,728 hours of service over the last forty-plus years, what is even more extraordinary is that their spirit of volunteerism has been passed down from generation to generation. “I remember Sal and Nacho as little kids coming to the food bank with their parents,” says Willy Elliott-McCrea, CEO of Second Harvest. “They have been volunteering with us for nearly as long as Second Harvest has been open. They are one dedicated family.” Sal and Nacho point out that they are not the only ones in the family who volunteer at Second Harvest. They have an aunt and cousins who volunteer, too. Margaret, who was born not long after the end of WWII, was raised in Hayward, California, in the East Bay. The family didn’t have a lot of money, but what they had, they shared. Margaret’s mother would cook up some food, and she and Margaret would bring it over to the nearby railyard and give it to the traveling workers, or, “hobos”, who rode the rail cars. As an adult, Margaret continued the family tradition of helping the hungry, and just like her mother before her, she and her husband Don Jesus encouraged the children to participate alongside her. The Blue Ribbon Selection Committee tasked with choosing 2017’s Hunger Fighters of the Year were not only touched by the level of commitment to the community that the family has demonstrated over the years, but by the Sandovals’ close bond. It’s been over 40 years since Margaret and Don Jesus brought their children to Second Harvest to sort food, but the experience has had a lasting impact. Sal and Nacho have followed in their parents’ footsteps by dedicating themselves to feeding the hungry, and there is now a new generation of Sandovals who are also volunteering at Second Harvest. Thanks to the way of life modeled by their parents, grandparents and great-grandparents, it would not be surprising if a future Sandoval is awarded Hunger Fighter of the Year a few decades from now. will be honored at Second Harvest’s Annual Awards Dinner on March 7, 2018.